Alcohol can affect not only your health but also your beauty. It affects your hair and skin the same way it affects the rest of your body. Alcohol is a diuretic and a depressant because it slows down the central nervous system. Ethyl alcohol or ethanol is an intoxication ingredient found in beer, wine, and liquor. Since it is a diuretic, it makes your kidneys work harder to remove excess water from your body instead of going to your organs and skin, which is the biggest organ in the body, so drinking a ton of alcohol leaves your skin dehydrated. Excessive drinking also depletes your iron and affects the levels of estrogen and zinc in the body, which subsequently affects hair growth. According to Brown University, constant consumption of alcohol can induce vitamin and one’s folic acid levels may fall too. All of those nutrients are vital to maintain healthy skin, scalp, and hair. How can you combat the negative effects? 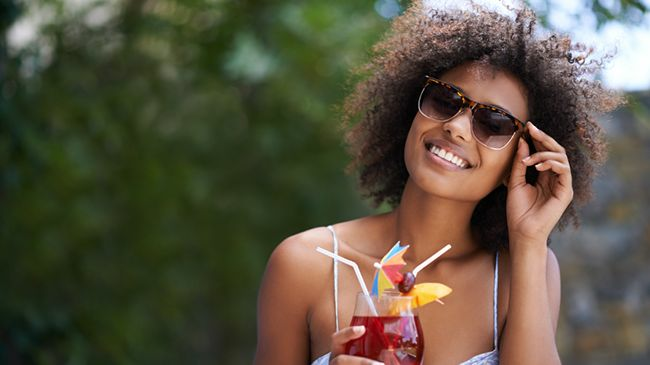 Here are ways to combat the negative effects alcohol on your hair and skin. You can simply cut down on your drinking if you find you are drinking too much or too often. The object is to have fun this holiday season but it will not be much fun if you cannot remember it or drink to the point of getting sick. Lowering your amount will lower your potential of dehydration. Simple and effective, drinking water keeps your body and hair hydrated. Try drinking a glass of water between cocktails. This simple trick will also stave off headaches, nausea, and puffiness many face after a heavy night of drinking. Drinking on an empty stomach not only makes you more intoxicated at a faster rate, it also tends to make you feel worse the next day. Food helps to absorb or slow down the absorption of the alcohol and that in turn decreases your depletion of hydration. Eat a well-balanced breakfast to replenish your body with the necessary nutrients to absorb the remaining alcohol that may be lingering in your system. Bananas are an excellent source of potassium and will help replenish those depleted electrolyte levels. Do not forget that help is always a step or even a click away so have fun this holiday, stick to these easy to follow tips and your hair (and skin) will not suffer!